North Korea continued firing short-range weapons over its own eastern waters today after a weekend of what it called "rocket launching tests" intended to bolster deterrence against enemy attack. South Korean officials were investigating exactly what the North was testing. North Korea continued firing short-range weapons over its own eastern waters today after a weekend of what it called "rocket launching tests" intended to bolster deterrence against enemy attack. South Korean officials were investigating exactly what it was that the North was testing. North Korea regularly conducts short-range missile tests. Analysts say the recent launches appear to be weapons tests or an attempt to get U.S. and South Korean attention amid tentative signs of diplomacy after soaring tensions that followed UN sanctions aimed at a North Korean nuclear test in February. The two projectiles fired by North Korea on Monday had similar trajectories as four previous launches over the past two days, according to officials at Seoul's Defence Ministry and joint chiefs of staff. Officials were analyzing whether the projectiles were missiles or rockets fired from a large-calibre gun North Korea may be developing, the officials said on condition of anonymity, citing department rules. 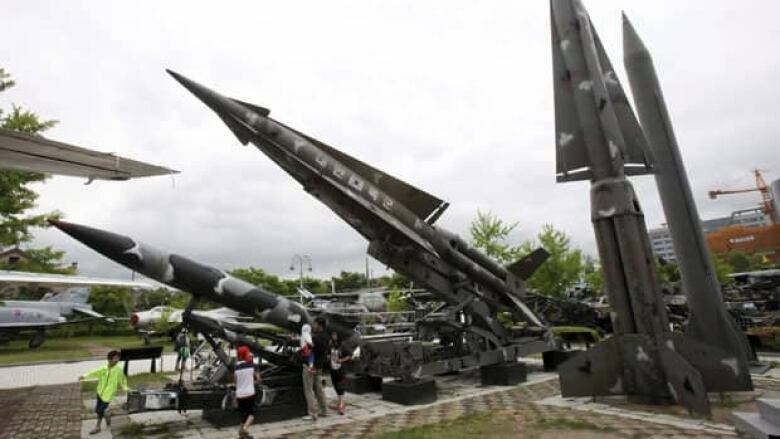 Defence Ministry spokesman Kim Min-seok told reporters earlier Monday that South Korea is taking seriously whatever weapons North Korea develops because it could attack the South. He said artillery guns with a larger calibre will likely have more destructive power. In Washington, Pentagon press secretary George Little said Monday the Obama administration does not consider the short-range launches a sign of renewed tensions. "These short-range missile launches do not necessarily violate their international obligations," unlike the North's recent nuclear test and long-range rocket launch, he said. North Korea's Committee for the Peaceful Reunification of Korea on Monday called South Korean and U.S. criticism an "intolerable challenge" that is deepening tension. It said it conducted "rocket launching tests" on Saturday and Sunday as part of drills to bolster deterrence against what it calls U.S. and South Korean plots to launch nuclear strikes against North Korea. It didn't comment on Monday's firing. North Korea has a variety of missiles, but Seoul and Washington don't believe the country has mastered the technology needed to make nuclear warheads small and light enough to be placed on a missile capable of reaching the U.S. The Korean Peninsula officially remains in a state of war because the 1950-53 Korean War ended with an armistice, not a peace treaty.